The stately Ministry of Defence Head Office building is situated opposite to Sawaddispha Gate of the Grand Palace. It is distinguishable with its Neo-classic architecture of Neo-Palladian style that is expressed by a virtually square plan surrounding an inner court and the front porch facing west. The facades are decorated with gilded Royal Guard emblem on the pediment, superimposed order of pilasters, and the emblem of Ministry of Defence on the balcony parapet, which is a later addition. 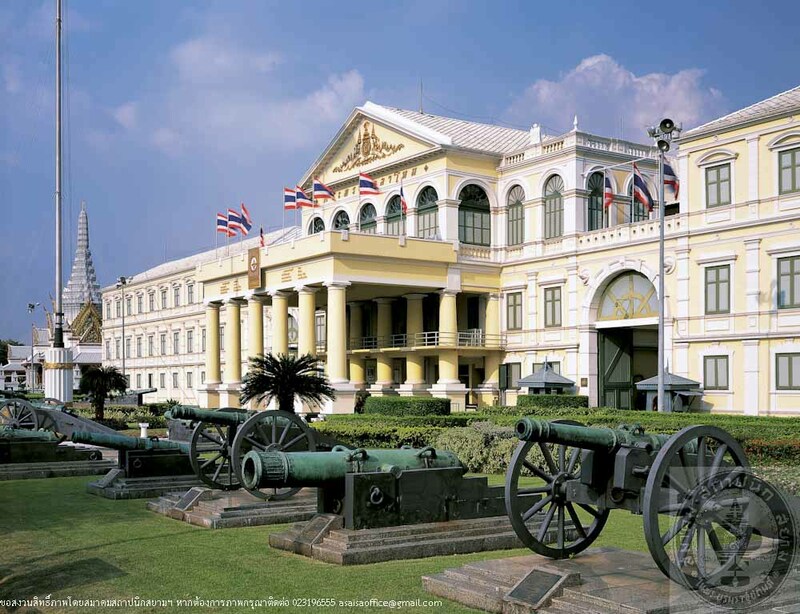 In olden days, the area where the building stands was a location of 3 palaces of princes in King Rama I’s reign. In later periods, those palaces were demolished and replaced by other buildings such as stable for horses and silk factory. Until the reign of King Rama V, he had a barracks built on this land. The barracks was intended to be a place where soldiers, weapons, beasts of burden, vehicles and provisions are organized. It was called the “Front Barracks” before changing to provisions are organized. It was called the “Front Baracks” before changing to “Ministry of Defence” after reorganization of the administration system. The building was designed by an Italian architect, Mr. Gioachiro (Joachim) Grassi. Construction supervision was assigned to Chao Phraya Thammasakmontri (Choem Saengchuto). On 18th July 1884, Ministry of Defence Head Office was officially opened and it has been used as the head office until the present day.